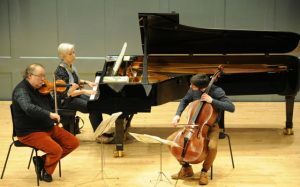 ‘The dark days of February have been indelibly brightened by Winterplay, a new weekend chamber music festival curated by pianist Susan Tomes. With workshops for children and concerts featuring teenage talent and internationally acclaimed musicians, the festival aims to encourage more people to play, and listen to, chamber music. In Saturday night’s Beethoven concert, Tomes, with violinist Erich Höbarth and cellist Philip Higham, gave an exemplary demonstration of ensemble playing at the highest level. In the ‘Archduke’ Trio in B flat, all three instruments were perfectly in balance, echoing each other’s turn of phrase and expression with precision and eloquence. The musicians beautifully interwove Beethoven’s intricate themes and captured his mysterious chromatic forays into modernism in the scherzo, which haunt the finale like a message from the future. Tomes chose two sonatas Beethoven wrote at about the same time as the ‘Archduke’ trio to set it in context. The Sonata for piano and cello in C major, opus 102 no 1, with its sweeping cello lines juxtaposed with piano passages of the utmost delicacy, also show Beethoven pushing at the boundaries of conventional form. Like a couple who finish each other’s sentences, Tomes and Higham expertly picked up the run-on phrases in the finale. This entry was posted on Monday 12th February 2018 at 6:30pm	and is filed under Concerts, Reviews. You can leave a response, or trackback from your own site. So pleased to read this review! Congratulations – and “Thank you” – for all the hard work that went into organising the event.